We define classical fencing as fencing for sport or the duel, conducted in the manner of fencing in the years between 1880 and 1939, as reflected in the rich variety of fencing manuals in English, Spanish, Italian, and French that survive from this period. It is defined by the transition from a common set of weapons for civil and military use to a distinct set of weapons for primarily sporting and civil use, and ends with the development of the sports factory approach to training and the conversion to electrical scoring after World War II. The classical period is important in the history of fencing as it makes the transition to the set of weapons we still use in modern fencing and establishes the form of footwork and blade technique that is the foundation for modern fencing skills. Classical fencing differs from modern fencing in its emphasis. Modern fencing emphasizes footwork, timing, and distance control as critical tactical components on a longer strip, and has generally simplified blade actions, concentrating on the creation of conditions in which a fencer can score with his preferred tactics. Classical fencing has a greater emphasis on a richer range of bladework, executed on a shorter strip that puts less emphasis on sustained rapid footwork movements. Our classical fencing programs are conducted as part of the activities of our center for classical fencing, the Classical Academy of Arms. Classical fencing is an ideal activity for those who wish to study the evolution of fencing or who wish to explore the whole range of complicated blade actions employed in this period. Open badge for the Rank 9 award in Classical Foil. Weapons we teach include the foil, sabre, and dueling sword (or epee). Dueling sword is taught for fencing one touch bouts, as opposed to the five touch bout of the other weapons. We teach foil and epee with the French, Italian, or Spanish grips, Epee with the centered bell, and sabre with the Radaelli, Pecoraro, or more modern Olympic or Hungarian guards. For safety, all blades are modern blades. Bouts use visual scoring by the members of the Jury (Judges and the President, or Director) as opposed to the electronic scoring of modern fencing. All instruction is based on the technique taught by fencing masters in the period 1860 to 1939, as documented in the fencing manuals written at the time. Our focus is on understanding how the weapons were actually used and on being able to recreate the techniques and tactics of the period. 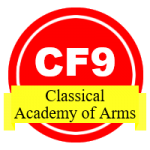 We use the Classical Academy of Arms skill development program to provide structured objectives for both knowledge and skill acquisition in a 9 rank program that requires written and practical skills testing for each weapon. Earning a rank is recognized by a certificate, sleeve patch, and electronic open badge. Classical foil, epee (dueling sword), and sabre instruction is available by appointment. All classes are taught by Maitre Walter Green, who has studied classical fencing since 1971, and who is certified by the Classical Academy of Arms as a Classical Fencing Master. 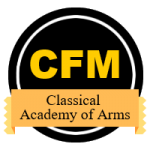 The Classical Academy of Arms open badge awarded for certification as a Classical Fencing Master. We also provide instruction for individuals interested in training to become credentialed teachers of classical fencing. The Classical Academy of Arms certifies instructors in five ranks: Classical Fencing Apprentice Instructor, Demonstrator, Instructor, Provost, and Fencing Master. At each level written and practical tests are required, with a research paper at the Classical Fencing Provost level and a thesis for Classical Fencing Masters. Apprentice Instructors, Demonstrators, and Instructors are required to be able to teach one weapon, Provosts two weapons, and Masters all three weapons. The focus is on the traditional teaching lesson, with the competency required at each rank tied to the various skill levels of the CAA skills program. Earning a rank is recognized by a certificate, sleeve patch, and electronic open badge.